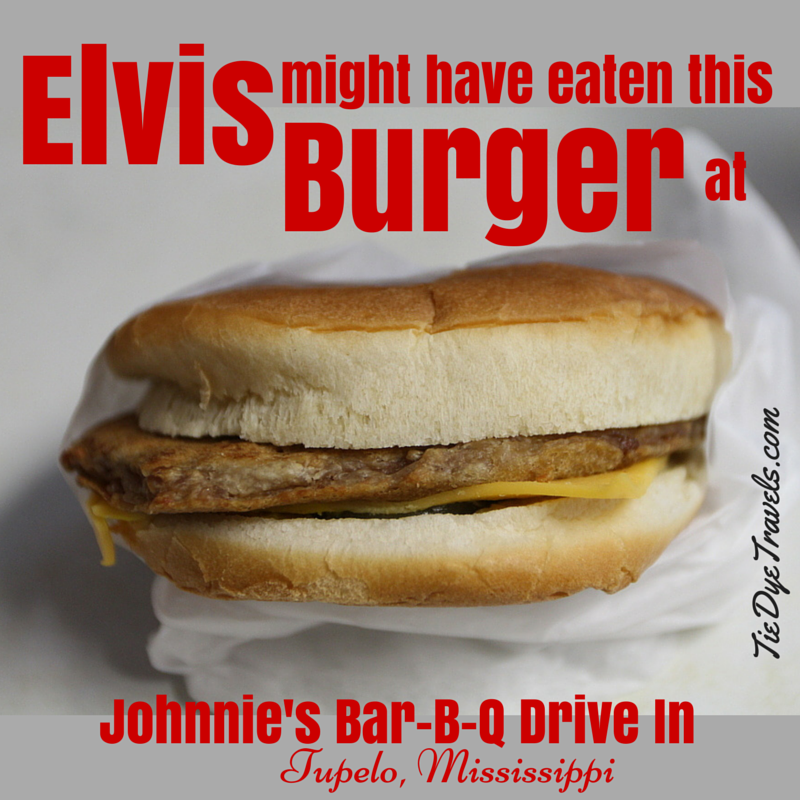 Road Eats Johnnie's Drive In, Tupelo, MS - Where Elvis Ate. 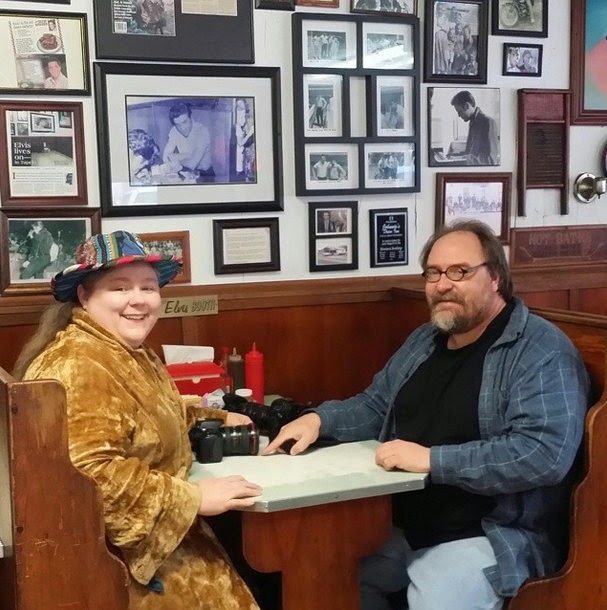 Finding places to dine with interesting stories is just what I do. Oftentimes I have a tip, a recommendation or a suggestion from someone who reads this blog. Sometimes I'm pulled off the road by the scent of something excellent. But sometimes... sometimes it's just serendipity. It was the end of the Birmingham trip, a Monday morning. We had overnighted in Tupelo after dining in Corinth, and our only set plan was to head back to Little Rock and pick Hunter up from school by the end of the day. Grav has spent a little time in Tupelo, and I had a tip from a year back on a great Italian joint to check out (more on that in a moment), so what was another hour, anyway? 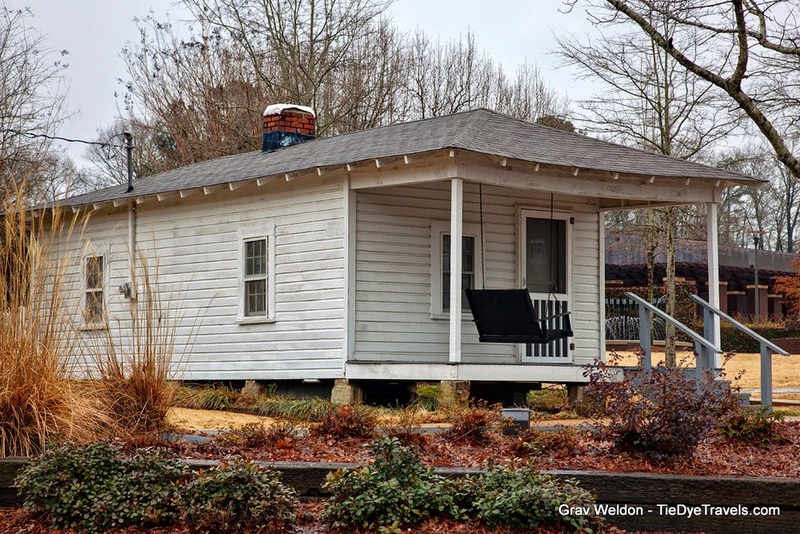 Plus, we wanted to scout the Elvis Presley birthplace, in case I decide to return for a story. Unlike our time in Birmingham, it was cool, damp, muggy. We drove through a mess of a construction zone to get to the Presley birthplace and museum, pulled up... and... well, here's the thing. A lot of time, reporters work on intuition and have an idea whether a story is going to work or not. Something told me this was not the day to explore the birthplace of The King. Something in me said "save it for later." Grav popped out, took a few photos, and we prepared to hit the road again. Except, on the way there, we'd seen a couple of restaurants that had piqued my interest. 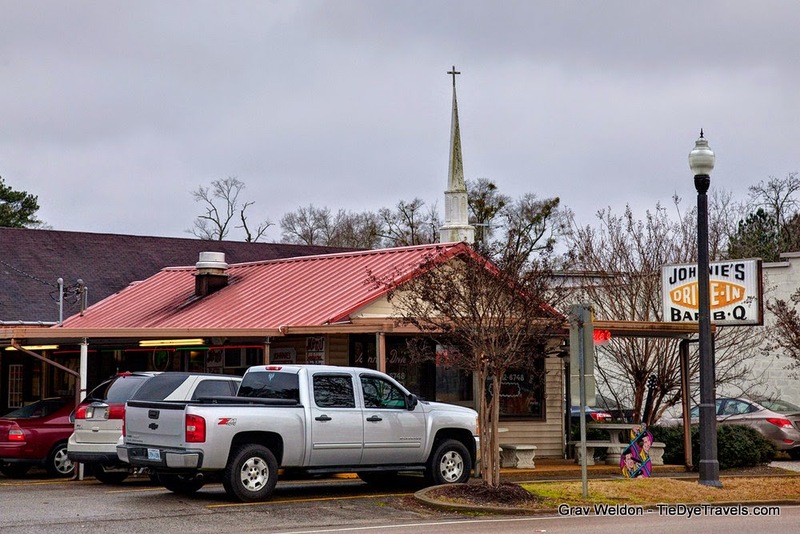 Might be because I've spent all this time recently working on my Classic Arkansas Eateries series... but when I notice a certain look to a restaurant's architecture, or notice a name, I mentally file it away for later. And within blocks, there were two such places. I figured once again, take a few photos, make a few notes, come back later. to write up another restaurant in town) and we'd take off. But moments after I pulled into a spot, a carhop came up and asked if we wanted to order from the vehicle or come inside. 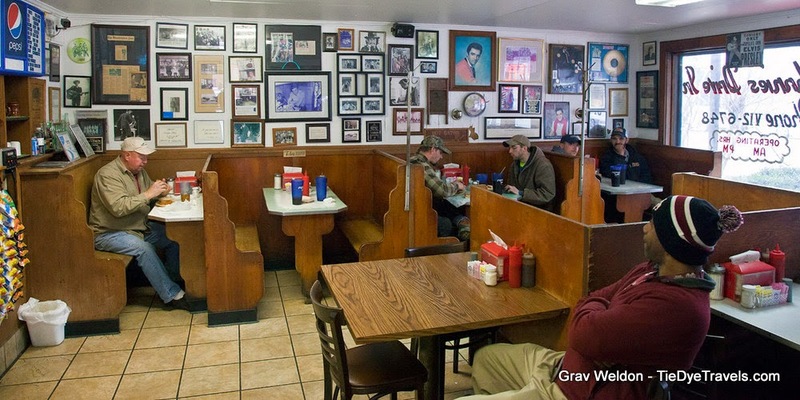 The moment I stepped inside Johnnie's Bar-B-Q Drive In, I knew I wasn't going to leave without a story. Every wall was covered with memorabilia or this or that. A sweet waitress suggested sitting wherever we liked. And a gentleman sitting in a booth opposite the door offered his seat. Above that seat was a photograph of a young Elvis Presley. Immediately, I connected the appearance of the young Elvis with that of the singer sitting with Jim Ed and Maxine Brown at the Trio Club. This was a photo that had to have pre-dated it. Yes, that was indeed the case. Though we protested, the very nice gentleman who had occupied the booth (who only really identified himself to us as a "regular") scooched aside and we had a seat. As we sat down the BACs and glanced around, we were regaled by both our waitress and this kind man about the significance of the place. Seems the young Elvis Presley visited quite often as a youth, sure to dine when he could, but more likely to come with a friend and split an RC Cola. That seemed like a perfectly natural thing for a young man to do -- even in my youth, I'd walk down to the laundromat or even to the closest grocery to enjoy a cold bottled beverage, back when it was okay to wander at the age of six or seven or eight. The booth itself, marked "Elvis Booth" (to avoid any sort of confusion, I'm certain), was unchanged from those days. Varnished wooden back, white tabletop, and above all matters of photos, including a large image of Elvis sitting in the booth as a young man. 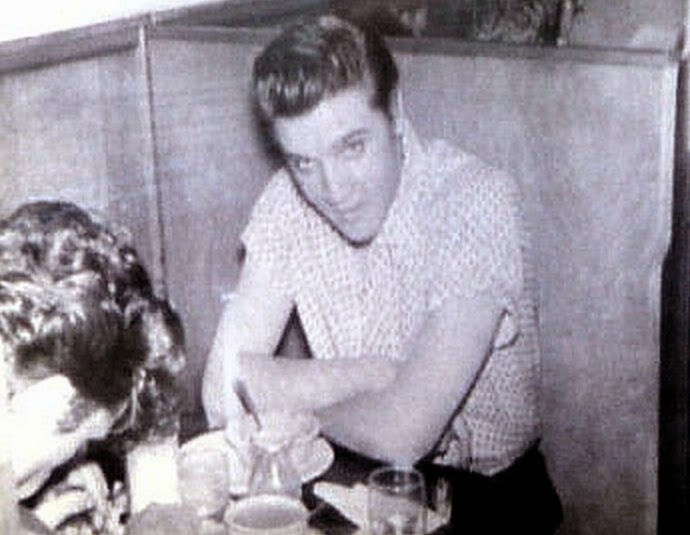 Turns out a gentleman named Paul Cramer took the photo back in 1956, back when Elvis was just starting to become famous. 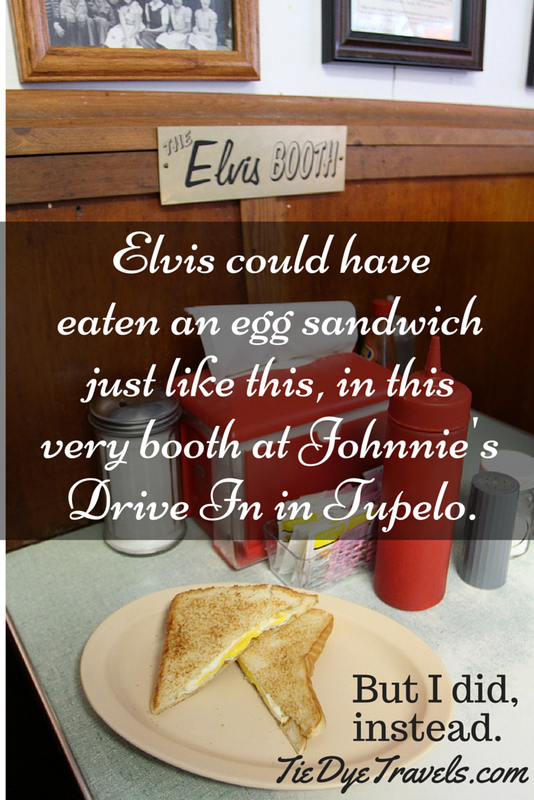 A note in a cracked picture frame notes that Cramer was traveling as a jewelry salesman, and he was showing his wares to a Tupelo jeweler when a girl came in and mentioned Elvis was next door. Cramer walked over, saw this was true and asked Elvis f he could take his photo. Once permission was given, the photo was shot. Cramer forgot about it until 1997, when he found the photo amongst his belongings and gave a copy to Johnnie's. Interesting thing to me is, looking at the photo and the shots Grav and I took inside the restaurant, Elvis had to be shorter than me. Is that right? He was reportedly six feet tall and I'm 5'9". Must be a trick of the camera. All this was very well and interesting, but I wanted to know more about the restaurant itself. Turns out it was opened way back in 1945 by Johnnie Chism, who had just been discharged from the armed services. I understand he built it on the same block where his mom and dad had a grocery. It's not a big place by any means, but there is outdoor seating up front and of course you can eat in your car, as we discovered. "All meat hamburger," our waitress asked, ready for our order. We ordered drinks and I asked for an egg sandwich. An egg sandwich sounded fantastic right then, and maybe it wouldn't mess up my appetite too much for the next restaurant. Grav asked about the difference in burgers, and we were regaled with the story of how back when the restaurant was opened, rationing was still in effect. Beef was one of the items purchased with a combination of money and ration coupons, and to make it stretch further, it was often mixed with flour before cooking. This intrigued us to no end. 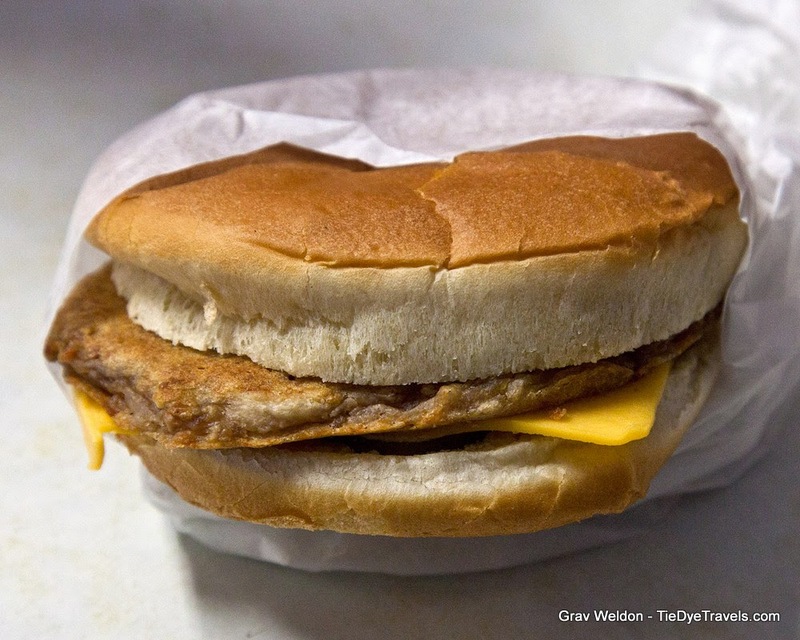 I've been a lot of places, but I had yet to encounter in my adult life a place that still sells burgers this way (I actually remember eating burgers like this a few times as a child). Yeah, we had to try that. It occurred to me, moments after ordering those sandwiches along with a pound of barbecue for Grav to take home and share with Hunter, that we were in yet another cash-only restaurant. This particular trip had been hard on our cash, and we pulled out our wallets and my change purse and counted out what we thought was going to be our bill, a bit nervous, since we were very concerned about having enough for a tip. I mentioned there was still change in my car door we could fetch. We ogled the whole place a little while we were waiting, but also looked at our phones and calculated the time. A typical restaurant visit takes about an hour and we had drive time and traffic to worry over. It didn't really matter. It doesn't take much time to cook up a flat burger or fry an egg. In fact, it probably took about as much time to do either as it did for us to whip out our BACs and phones and document the dining at this august restaurant. My fried egg sandwich was EXACTLY what you'd expect a fried egg on toast to be. It was fried and eggy. Okay, I mean, it was exactly what I wanted but there's not much you can say about it. make it very thin so the grease from the beef cooks the flour. The key to it being palatable is to add enough seasoning to make it work. 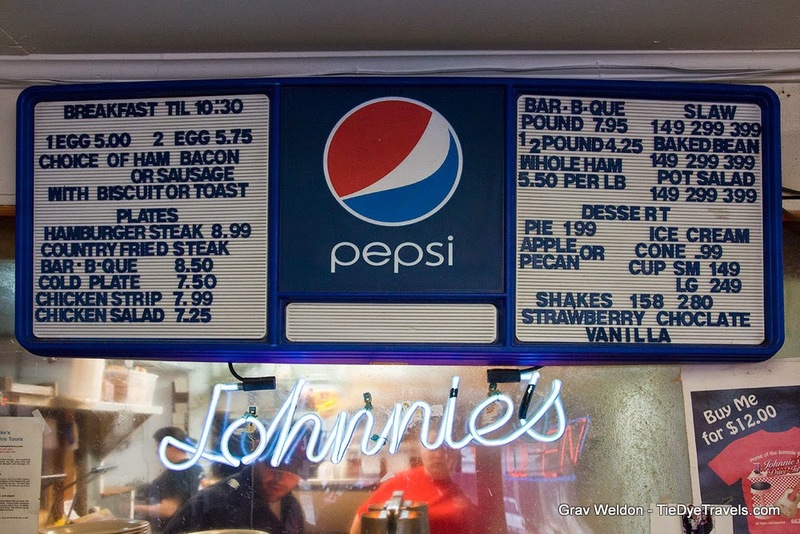 And of course Johnnie's has this down pat, else I doubt it'd be offering these burgers any more. It was satisfying. 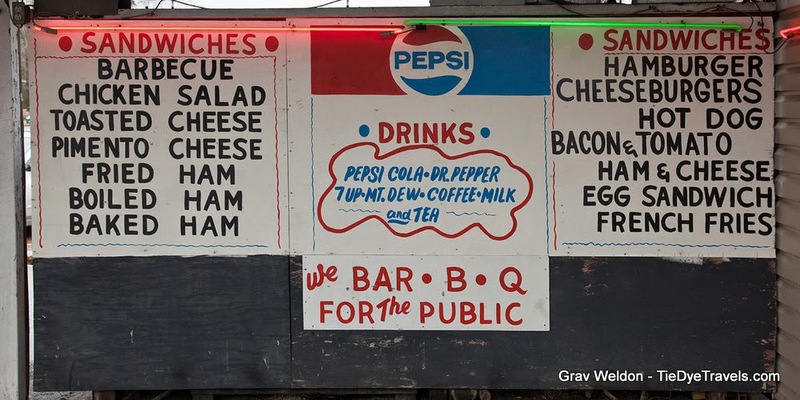 Our waitress came out with Grav's barbecue in a bag, and we set out, briefly stopping to photograph the Dairy Kream before crossing town. Imagine our disappointment to find nothing left of Vanelli's, the restaurant we had expected to try. Turns out Vanelli's had been wiped from the face of the Earth by a tornado less than a year before our visit. From what's available on the website, Vanelli's will be coming back this year, and we'll have to visit Tupelo again. Next time, maybe it'll feel right to go visit the place where Elvis grew up. We still found a story. The Dairy Kream Ribeye sandwich is out of this world. 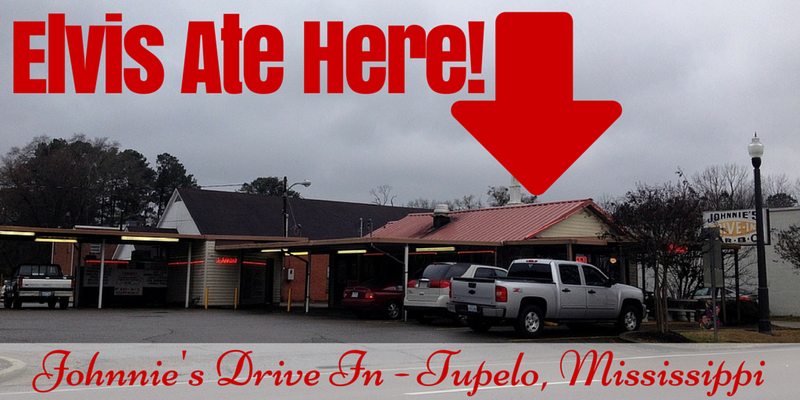 When you're back in Tupelo, you must give it a try! Dairy Kream..... Best hamburger and fountain coke you can buy! !